Great tennis players or cricketers often talk about knowing when they are at the top of their form because the racket or bat feels like an extension of their arm. The same holds true in the game of golf. If the club is moving in perfect time with the body, then the swing action is going to be a fluid one and the result is going to be a smooth contact between club face and ball and, therefore, a much more impressive shot. The opposite is also true. If you don't prepare properly to address the ball or your body is not correctly positioned, then the action that will follow is unlikely to bring the desired result on the fairway. Even worse, you could be leaving yourself open to injury because one or more muscle groups such as the shoulders or the ligaments of the knees are being asked to perform an unnatural movement and strain is being put upon them. So posture is not only about maximising your technical ability but also is crucial in avoiding any physical stress or strain. Learning the hard way, or more likely the painful way, is not recommended. As a simple routine to achieve correct posture, stand parallel to the line of the ball with your feet positioned directly below each of your shoulders. Take the club and hold it out straight in front of you and then slowly lower it, bending from the hips as it descends, until the club head is resting on the ground. It should be noted here that the action of bending is coming from the hips - on no account bend your back, rather it should be straight, providing a central line around which the rest of the upper body can manoeuvre smoothly and efficiently during the swing action. The next important point is checking your balance. Lightly shift your weight from one foot to the other in a bouncing movement and flex the knees to bring the torso slightly forward. Remember to keep that back straight. Is your lower body feeling flexible and acting as a solid, stable foundation for the trunk shoulders and head to move freely above it? 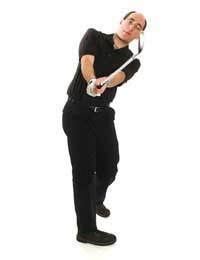 Step away from the ball, repeat the drill outlined above and take a number of practice swings. How does that feel? What you want to be experiencing is a smooth action from the head to the toes and a club head that moves from backswing to follow through in one rhythmic movement. Step forward, address the ball and take a shot. At the end of the swing, do you still feel that your body is in a balanced position? Initially taking the position to ensure perfect posture can feel a little strange, but in time it will become a routine completed almost without thinking. Remember that in golf, those good habits will last a lifetime. And if you keep up the good work, perhaps one day you, too, will feel that the club feels like an extension of your arm.